As they approached Thanksgiving in 1985 the Browne family, members of Covenant Christian Community, assembled three baskets, each containing just a turkey and a few extras, as gifts for households in need. Thirty-two years later, this generosity has grown into an outstanding legacy, providing the ingredients of a Thanksgiving dinner for many families of 4, plus basic food items for each family such as tuna, fresh fruit, eggs and more. Started by Covenant, this project has been embraced by local churches Pavilion of God and Seekers. The financial times have affected the project, both positively and negatively, causing the number of Baskets (really boxes and bags!) put together each year to go up and down over the years. 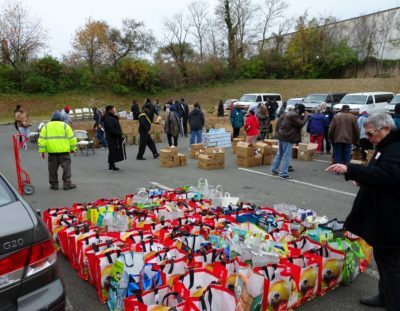 This year 80 volunteers gathered early on the chilly Saturday morning before Thanksgiving to assemble the boxes and bags, and fill them with contributions from members of the participating churches and area businesses including Starbucks Takoma Park, Trader Joe’s Silver Spring, Salon Jam, Amano and Mark’s Kitchen. And we could not have done it without Shopper’s Food Warehouse who offered us a generous discount and threw in items for free. By the end of the day, 105 families in need were served. The families served include senior citizens, veterans, and low income families from Ideal Academy Charter School and each of the three churches involved. This all-volunteer effort is coordinated by a planning team with participation from all three churches. As they look forward to next year, the Thanksgiving Basket Project team is inviting us to watch for their “Go Fund Me” campaign in 2018, to help get the level of generosity back to 300 Thanksgiving gifts!